Business Schools Mull Over Blame In Financial Crisis American business schools trained many of the people who had their hands on the tiller when the nation's economic ship ran aground. Now, some of those in leadership positions at top schools are asking themselves what degree of responsibility they bear. In the following story, Professor Stephen Kaplan characterizes Philip Delves Broughton in a way that was offensive and that had no basis in fact. Kaplan has since apologized to Delves Broughton. Harvard Business School has created a faculty-led task force to assess, among other things, how well the school prepared its students prior to the financial crisis. Harvard Business Review: "Are Business Schools to Blame?" Harvard Business Review: "How to Fix Business Schools"
American business schools trained many of the people who had their hands on the tiller when the nation's economic ship ran aground. Now, those in leadership positions at top schools are asking themselves what degree of responsibility they bear. The schools had critics before the economic crisis cost millions of Americans their jobs and their retirement savings. Now, the critics are louder, and the questions they raise are being taken more seriously. "This is a time of great introspection for this institution," says Jay Light, dean of the Harvard Business School. Light has set up a faculty-led task force to assess, among other things, how well the school prepared its students prior to the financial crisis. "A number of wise men have said, never let a good crisis go to waste. And I think those are really wise words," Light says. "We can't improve our service. But we can improve our price. We can make it higher," says an executive character in the ad. Phillip Delves Broughton, an alumnus of the Harvard Business School, says a procession of Harvard–trained MBAs played starring roles in the economic collapse. "George W. Bush was a Harvard MBA. Hank Paulson was a Harvard MBA. 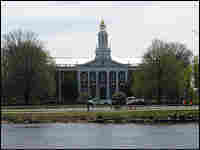 The CEOs of General Electric, Procter & Gamble, the heads of hedge funds, private equity funds [were Harvard MBAs]," Broughton says. In a piece he wrote for The Times of London, Broughton calls them all Harvard's "masters of the apocalypse." "There are lots of people in private equity and hedge funds who you've never heard of, but they all came from Harvard or Wharton or Columbia," Broughton says. "And I think you have a group of people who have the same education, who know each other, who've created an economic system that has created an enormous amount of hardship for people, and I think unnecessary hardship." Stephen Kaplan, a professor at the University of Chicago's Booth School of Business, calls Broughton "completely nuts." Kaplan says that blaming business schools for the crisis is wrong. "You look at the business world and the global economy since 1980, and it's stunning. Productivity growth around the world has been terrific. You know, where did all this come from? There's a huge success story of the tools of markets and economics that are taught at business schools," Kaplan says. Kaplan says the current crisis had many causes and that it is too simplistic to hold business schools primarily responsible. Light of Harvard also rejects dumping blame on a handful of Harvard M.B.A.'s. "I think that's misleading," Light says. "Look, we have 70,000 alumni." Light says hundreds of those alumni are running successful companies. Still, he says business schools can share the blame for the crisis with just about everyone — including CEOs, government regulators, even homeowners — all of whom failed to understand the risk of a fragile financial system. He thinks it's pretty clear why. "Frankly, the world hasn't seen much downside. We've had a spectacular 25-year period of primarily growth, primarily profits. We've spent less and less time thinking about the other side: what could go wrong. And that, for sure, I think we should have all been thinking more about that. I think business schools are included in that." Eric Heart, a second-year student at Harvard Business, agrees. "I think what this crisis has highlighted is just how systemic risk can be," Heart says. Many of the biggest players in the financial meltdown were MBAs from schools like Heart's. But he is confident that he's now learning the right lesson. "Probably the way I thought about [risk in the past] was more individual, risk confined to certain kinds of investments and certain kinds of industries. But looking forward, it's something that I will think about a lot more from a business perspective. How do we avoid the risk that's all around us even if we're not creating it," Heart says. Beyond that lesson, the financial crisis is energizing an old debate about what the role and mission of business schools should be. Some say it adds urgency to the case that B-schools must do more than just teach managers how to maximize profits. "That basic model — the fundamental model, which really made up the fabric of contemporary business education, has to be revisited," says Rakesh Khurana, a professor at Harvard. Khurana says business schools have drifted away from their original mission: to create a true management profession for the benefit of society, rather than churn out consultants and hedge-fund hot shots. He says students need to emerge from business schools with a different mind-set. "One of the most important things would be, 'I will create value rather than extract value,' and not, 'I'll get back to society after I make a lot of money.' They have to start seeing that giving back to society in the course of business is possible when one conducts oneself along the lines of a professional business ethos," Khurana says. Khurana says business schools have yet to agree on a shared body of knowledge and values in the way that medical schools and law schools have done. Angel Cabrera, president of the Thunderbird School of Global Management in Arizona, agrees. He says that in the wake of the current crisis, business schools must do more than just tinker with their curriculum. "We're really talking about something deeper — to look at management as a true profession and compare it to medicine and law. Professionals exist to serve the greater good, and they have codes of conduct to minimize the harm they can do to society," Cabrera says. Cabrera says all business schools should agree on ethical codes that go beyond the rules and regulations of the marketplace. At Thunderbird, his graduates can opt to take a kind of Hippocratic Oath. "For example, our oath establishes a commitment to respect the rights and dignity of all people affected by the corporation. It establishes a commitment to combat corruption. I have no doubt that if we were successful at creating a consensus around a set of principles across business schools around the world decisions would have been quite different right now," Cabrera says. It's not clear how a Hippocratic Oath could even work in the real world, where competition often means driving your competitor out of business. And the critics point out that this kind of self-examination is not new. When the dot-com bubble burst, business schools rushed to add courses on ethics. That was much to their credit — though it didn't help avoid the current crisis. But many hope that this new round of soul-searching can help avoid the next crisis.